When you walk through the front doors, you’ll be greeted by a receptionist who’ll ask you if you have a reservation (it should be fine if you don’t), and aside from this you’ll see two escalators and that’s more or less it. We booked via OpenTable, where you can select the set menu as an offer. It’s always available on a Saturday between noon – 4pm even if you don’t book in advance, but I wanted the dining points and booking it in advance should help set expectations for the restaurant. A friendly member of staff will take you upstairs to the main restaurant floor, where you’ll be greeted with a chorus of welcomes in Japanese, before walking past the sushi bar and being seated at your table. I really liked that you could see the sushi chefs in action and was almost tempted to ask to sit at the bar, but I think the table was definitely the right choice for our dining experience. The set menu was £47 for 7 courses, a cocktail + half a bottle of champagne. I initially misunderstood this to mean we’d share half a bottle of champagne. Nope – turns out we get half a bottle of champagne each, meaning we were supposed to finish a full bottle ourselves. Uh, my tolerance at that point was decent, but half a bottle of champagne plus a cocktail to myself would have had me on the floor, stomach full of food or not. Anyways, we started with our choice of cocktail – Cherry Iced Tea for her (she was nursing a hangover and was craving some form of tea) and I actually don’t remember what I had, although I’m pretty sure it was the Velvet Haiku as I was looking for something light and refreshing. I love miso soup anyway, and liked that the mushrooms gave it an extra dose of flavour and added a little more richness to the texture without being heavy. I also absolutely adore sesame and spinach so these were both wins for me. I have another photo of my cocktail as I really liked that my little cocktail charafe had an alcove on the outside for the ice, meaning my drink was kept cool without being diluted. I’d ordered it per our server’s recommendation and while it was perfect in terms of what I’d been looking for, it was only after she’d brought it out that I realised it was straight alcohol, no mixer. I sipped it slo-w-ly. I really enjoyed these small bites. My favourite was the aubergine as it was bursting with flavour and had a great texture – soft on the inside and just a tad crisp on the outside. Plus I just love aubergine. 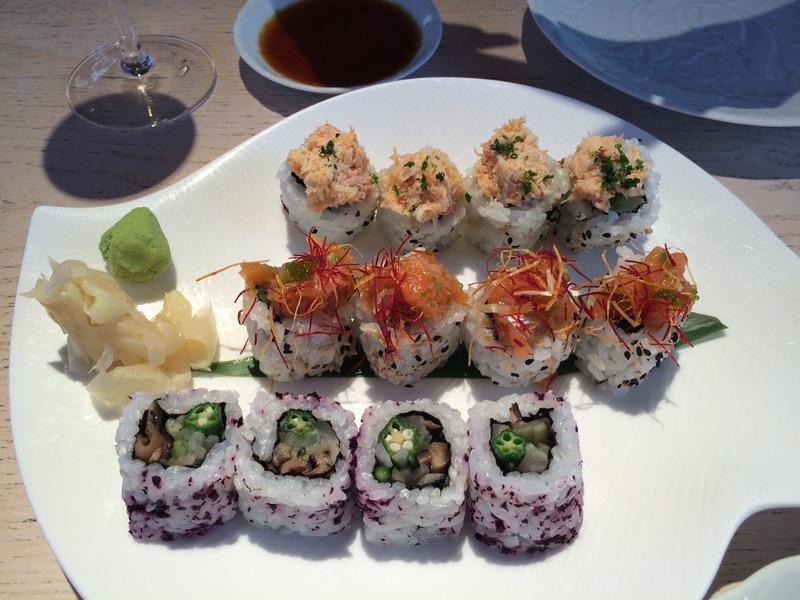 I’m also partial to tempura so the prawns were my second favourite out of these. The batter could have been a little crispier though, but I enjoyed it nontheless. I’ve never been a huge fan of tuna so purely due to personal preference that one was just okay for me. Plus it wasn’t melt-in-your mouth tuna so I wasn’t overly impressed. 4. 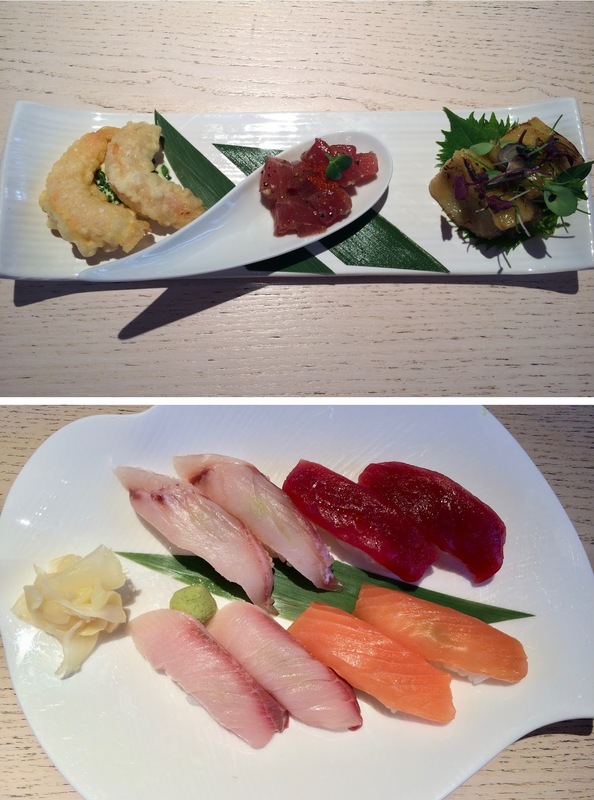 Nigiri – Akami (regular tuna), Hamachi (Japanese amberjack), Salmon and Suzuki (Japanese seabass) nigiri. Again I recall enjoying but not being overly impressed with any of these. I did like the salmon, but none of them were melting, moan-inducing, foodgasmly good. 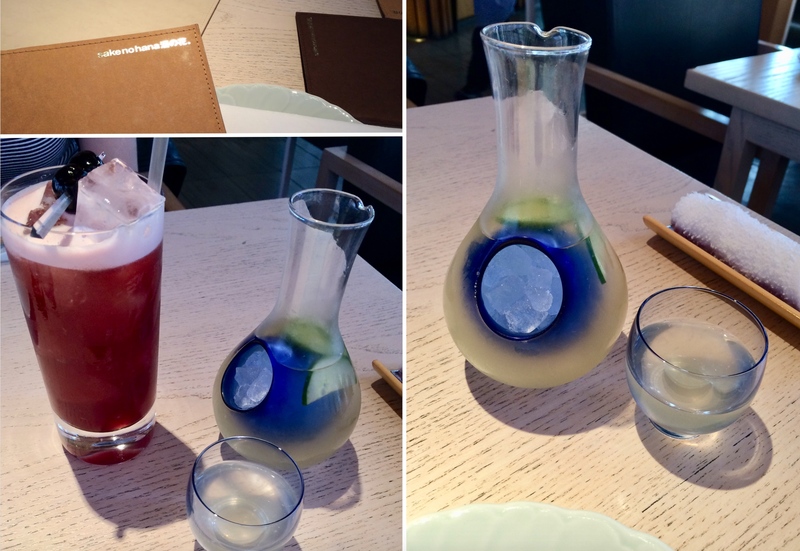 At this point I think I was surprised I wasn’t as impressed here as I had been at Hakkasan. But hey! The main course changed my mind. 5. 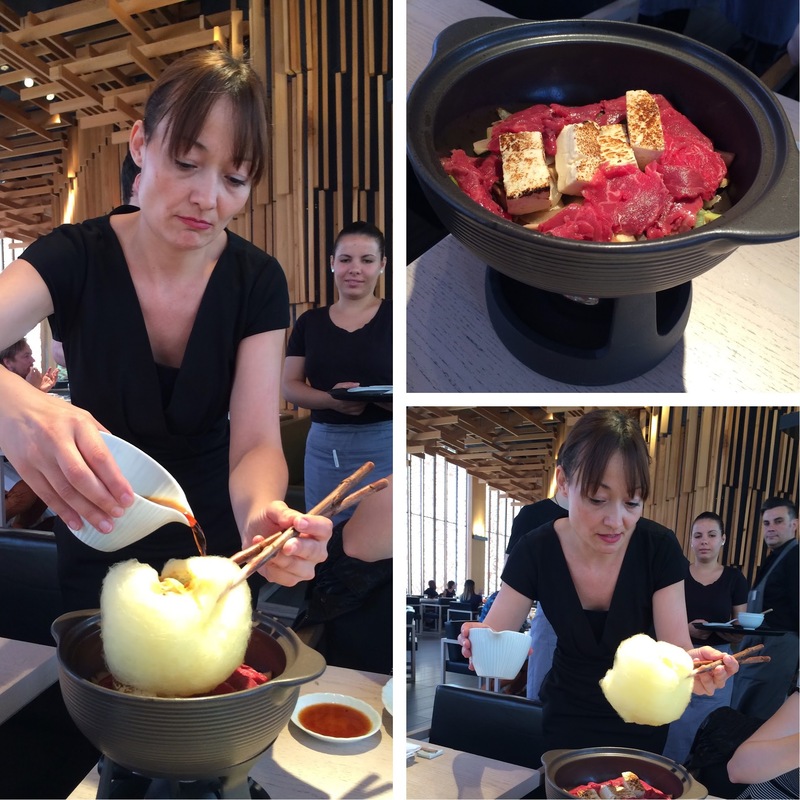 Sukiyaki with Yuzu Candy Floss – cooked at your table, rib eye beef with vegetables, tofu and shiitake. 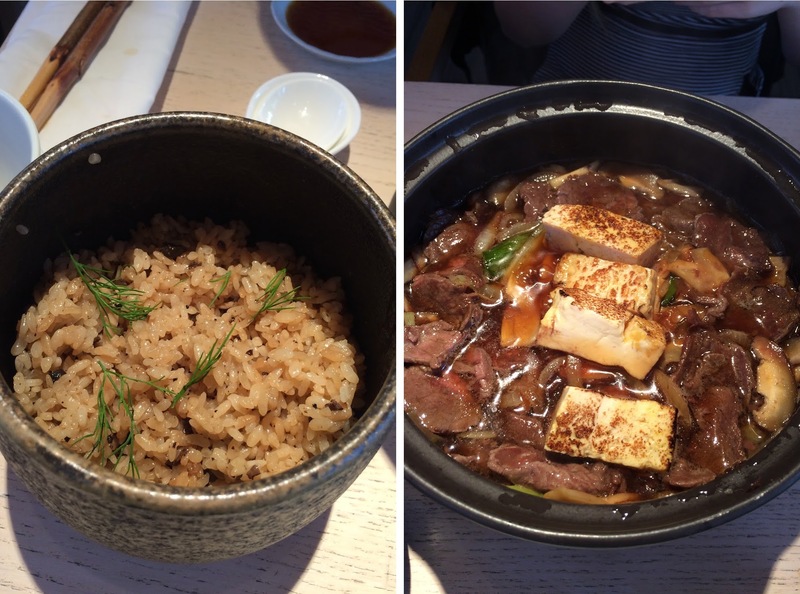 Served with Sasai Gohan – truffle and mountain vegetable rice. Ohmygosh. This is exactly what I’d been looking for. The beef was cooked only for about a minute, meaning it was perfectly medium rare (exactly how I like my beef) and as tender as can be. I love veg and that lightly fried tofu was definitely the way to my heart (I love love love tofu). The candy floss added a subtle layer of sweetness to the dish, and coupled with the truffle rice, the entire course was packed with complementary flavours that made it irresistibly delicious and I may have ended up overeating. At this point we’d finished our cocktails and had moved onto the champagne (I am pleased to report – we did not finish our entire bottle. I don’t think we even managed to get through half of the bottle between us) and had I been wearing jeans, I would have needed to undo the button and zipper to accommodate my expanding waistline. Then they brought out the next course. We didn’t even try to hide our shock that there was still a course to go before dessert. I think they realised we’d both forgotten to save space because we all laughed at our gaping mouths that there was still so much food to get through. Even my 4 cow-stomachs weren’t able to find space for everything. This may come as a shock to you, but – we didn’t finish it. I would like to applaud our valiant effort though – we managed to eat all of contents of the salmon maki and california maki (aka, not the rice). FYI, this was the nicest california maki I’ve had. That snow crab was divine. I don’t think either of us loved the okra maki though, so we kinda left that one out. I took some pics of the decor during a much needed digestion break. 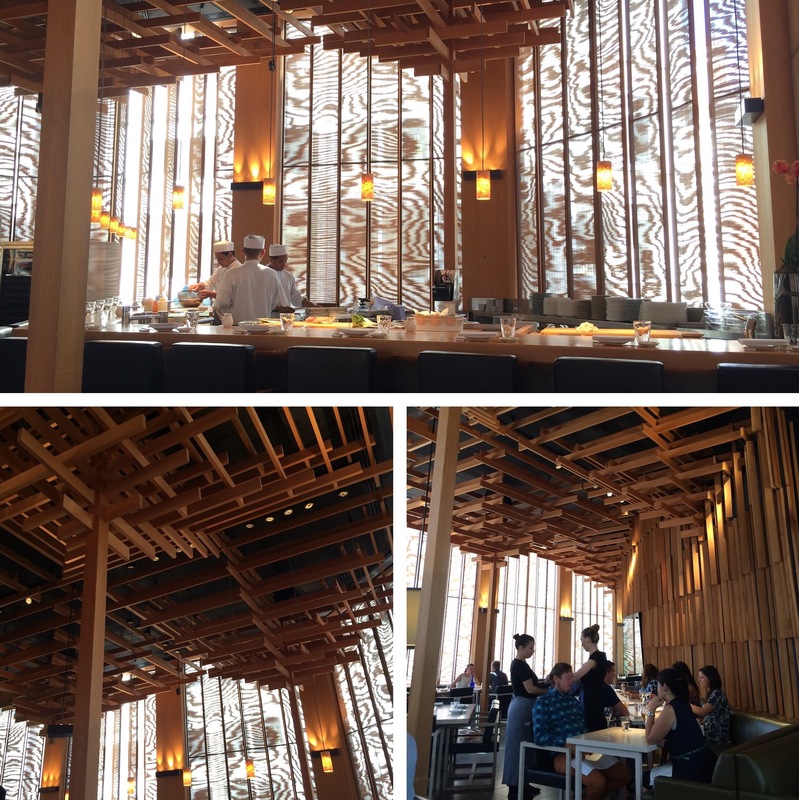 I really liked the restaurant’s large windows and its high ceilings decorated with Japanese-style wooden beams, and am always partial to a place where you can see chefs at work behind a sushi bar to be honest. 7. 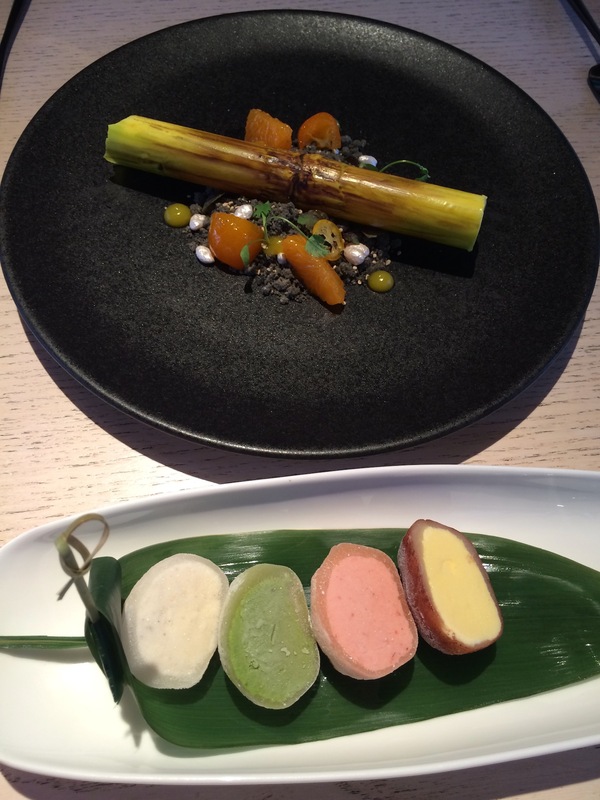 Dessert selection – I had the assorted Mochi Ice Cream and Emma ordered the white chocolate Bamboo, which came on a bed of black sesame soil, some crunchy pearls, kumquat meat, and oozed a kumquat yolk when broken. I adored my mochi ice cream and helped Emma out with her Bamboo. 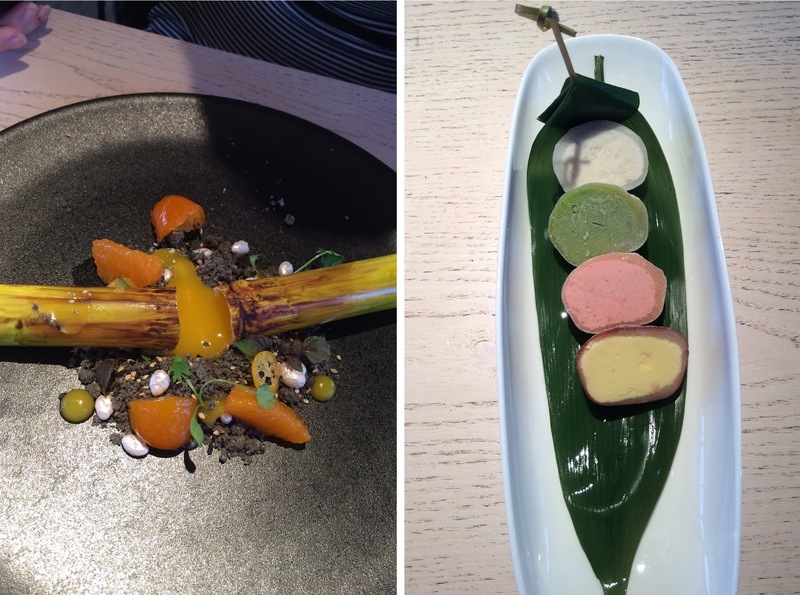 I loved the black sesame and how the flavours worked together – the sharpness of the kumquat cutting through the rich, sweetness of the white chocolate. Visually, her pudding looked more beautiful and I can only imagine the level of skill it takes to make that liquid filled chocolate log, but taste-wise, I’ll stick with my mochi any day. I’m a huge fan of mochi. Especially green tea mochi. Yum yum yum. Emma and I caught up about life, love and work over gastronomic bliss. We spoke about her success in becoming a BuzzFeed full-timer, recent promotion, my life in the US, and cheered at how far we’ve both come since meeting one another as geeky high-schoolers on a random forum on the internet through our mutual manga-obsession. Sprinked with a dose of freaking out at how long it’s been since we first met which means we’re both now getting SUPER OLD, of course. 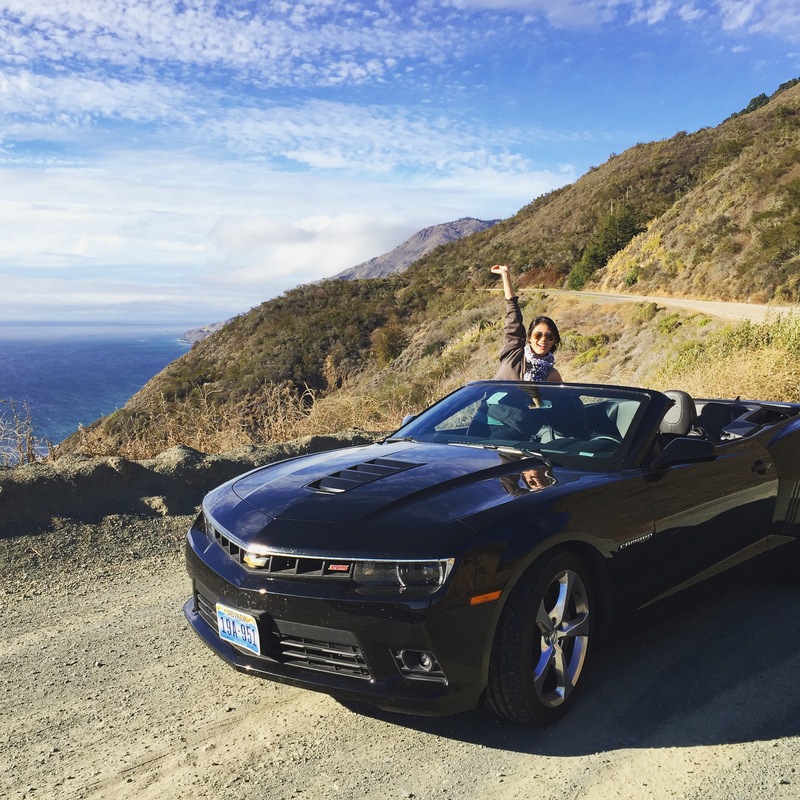 Yes – we met ONLINE before it became mainstream and cool! As teenagers, no less. And now look where we are! High five, Emma. What the restaurant states as should have been a max 2.5hr dining experience ended up becoming a full 4-hour ordeal as we arrived at 12:30ish and it was getting closer to 5pm by the time we left. 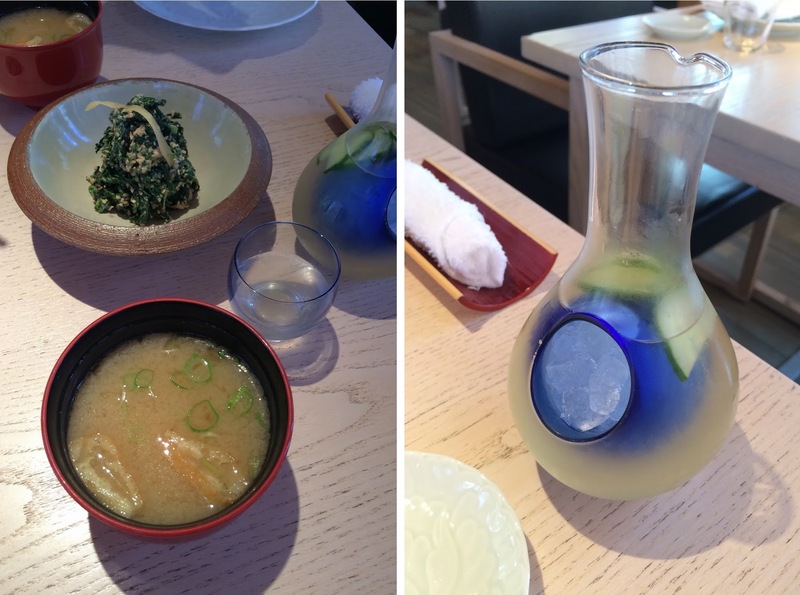 The service was exceptional and fully worth the 13% charge added to our bill. They were attentive without being overbearing and at no point did we feel we’d overstayed our welcome, despite having sat through waves of other diners. This could have been due to the fact that it was fairly quiet and there were plenty of empty tables, which surprised me given that it was a Saturday. We finally took our leave as the sun was setting outside and couples were entering for their early evening dates. I don’t think I had dinner that night, ha. Would I recommend it at least once? Definitely. Would I go back? Maybe. Even if only for that candy floss steak and mochi ice cream.